SPACE STILL AVAILABLE FOR YOUR GOOD QUALITY BOAT. WORTH THE DRIVE OVER TO OUR PLACE. We need your aluminum and fiberglass boats! The best part about our program is that if we don't sell your boat then you pay us nothing. No games or storage fees here. 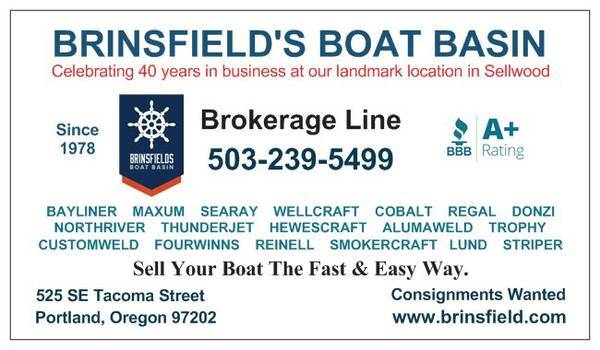 We encourage folks with boats for sale to drive them down to our place in Portland for maximum exposure, decreased selling time, and increased selling price. Selling a boat is a hassle - One quick trip over to our place and you get your weekends back! We can bring you top dollar in your pocket the fast and easy way! You set the price you want for the boat and we work above that for our commission - It's that simple. Brinsfield's Boat Basin - Where every day is a boat show. Celebrating 40 years in business 1978 - 2018. A+ BBB rated. 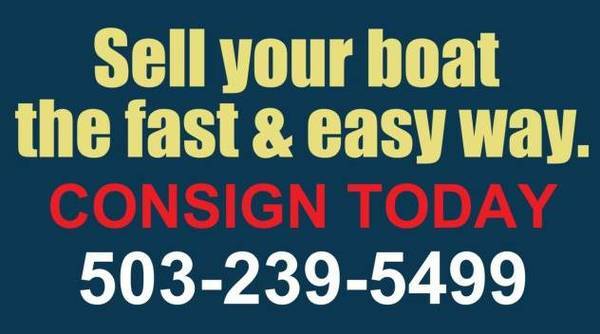 Highly experienced Marine Board & DMV agents. our boats on several local, regional, and national websites. With thousands of views in a good month between all the ads - no one can match our exposure - period. It's not unusual for us to get over 25 buyer inquiries a day. We'd love to be able to match up your boat with one of our buyers. If you want to work with the best in the business then look no further. or 503-278-8139 on weekends or after hours.